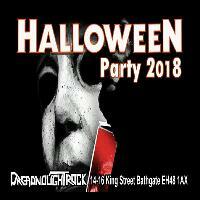 After the success of previous years Halloween at the Dreadnought has become the must be at Party in town and ALWAYS requires a ticket to guarantee entry. Everyone in the know flocks in for a damn good Rocking upstairs and down in a safe and most enjoyable atmosphere every year, catch some excellent Live Music and try to out-do one another's costume it has without a doubt become the best night on the calendar to come along to. Party ALL NIGHT Long, get a great laugh with your friends and Dread family. 2018 will be no exception and just like the previous years dare say the standard of costume will have to be epic if you want to win the best costume prize away from a certain someone. We open the doors at 7pm let things warm up nicely, get tore into the giveaways then have some Live Music from 9-10.30pm before allowing the tidal surge of costumed Rockers to flood upstairs before getting down to some serious partying thro till 3am. Live music this year from a firm Favourite ROCK COVERS BAND - STEELER ! IF you want to GUARANTEE ENTRY the only way is to grab an online or printed ticket in advance. Leave it too late and they sell out then you'll run the risk of missing out on a great night or have to take your chances at the door from 7pm and the VERY LIMITED AMOUNT that MIGHT BE LEFT OVER FROM ADVANCE SALES when they close on the day. Last year only had 30 left to sell on the night which took no time to get thro - this year who knows !! Please Note : No tickets will be set aside for anyone, you can't come at 7pm buy a ticket then nick away to return later - that's why tickets are made available in advance - you have to come in and there's not a lot of chances to do that normally so please watch out on the Facebook Event page for Sales Warnings posted in the run up to the night. Last year and some years before I read a few comments about why would you need a ticket to get in to the Nightclub ? Simple really............it's one of the busiest nights of the year and has been for the last 8 years so we have HAD to make it all ticket. Loads of effort goes into making costumes which has multiplied year on year to the point a very high percentage of people WANT to get a ticket and make sure they get in after all that costume work. So much so we can nearly reach capacity on advance sales alone so ask why wouldn't you want to ensure you'll get in if you are defo coming along all kitted out ? So for one of a few nights in the whole year we make it a TICKET EVENT for THE WHOLE Night and not just the Gig element. Tickets are a MUST THEN ? BASICALLY AYE ! Here are your choices for 2018 and remember No Vip offers available. This Ticket Guarantees your entry upto 9pm and is only Valid upto 9pm. Please note you don’t get flung out at 9pm like many thought in previous years, this is for those who like to get in early, make sure they are easily in for the start of the Live Music from 9-10.30pm , cash in on any Freebies going as they always go real quick then get the party started at the Dread in full costume. For those who can’t make it in before 9pm or didn’t get one of the limited Quantity £5.00 tickets the £7 Ticket Guarantees your Entry upto 1am is only valid upto 1am where 99% of those coming have already arrived and are already getting the place Rocking thro till 3am. By all means you can still come earlier than 9pm with mates etc if required. This purely gives you a wee bit more flexibility to come in between 7pm and 1am. I wouldn't leave it too late as you'll miss most of the fun !!! General Admission without a ticket will be a BIG GAMBLE THIS YEAR AGAIN and will be £8.00 at the door from 7pm till our 1am curfew IF there is room and ONLY IF there is room to get in will we accept general entry on Halloween. It will be a simple one out - one in which can happen later on and well into the night. Ticket Prices have been held the same for the last 7 years despite all our operating costs and staffing increasing substantially in providing such a top night for everyone so a small increase which was planned last year can no longer be avoided for 2018. The last couple of years has been right on our capacity level so if you can’t commit to a ticket before hand the gamble is yours to take and pop down. Our doorstaff will keep you right. Advance tickets go on sale in Printed form from End of July 2018 at our outlets. IF YOU MISS the deadlines for the Guaranteed ticket cut offs for any reason then we have the right to refuse entry to the ticket holder ALSO that Tickets ARE NON REFUNDABLE. We also have the right to refuse entry to anyone who has had one two many regardless if you have a ticket or not. If you have any queries before hand feel free to email alanr@dreadnoughtrock.com and I'll be happy to answer them.